The Norwegian authorities initiated on Saturday the helicopter evacuation of some 1,300 passengers from a cruise ship, victim of an engine problem off the Norwegian coast. "The cruise ship Viking Sky has launched an SOS, engine problems in bad weather," said the Southern Relief Center of Norway on Twitter. The Norwegian authorities initiated on Saturday the helicopter evacuation of some 1,300 passengers from a cruise ship, victim of an engine problem off the Norwegian coast. In another tweet, local police said the 1,300 passengers would be evacuated to the land. "It will take time to evacuate everyone . " "The boat only has one engine running and the winds are strong enough, so we prefer to have people on the ground ashore," the police chief of operations told AFP. Tor Andre Franck. Around 16:30 (1430 GMT), a hundred people had been evacuated by helicopter. Four aircraft were dispatched to the site to make shuttles between the ship and the land with the evacuees, said the Emergency Center. 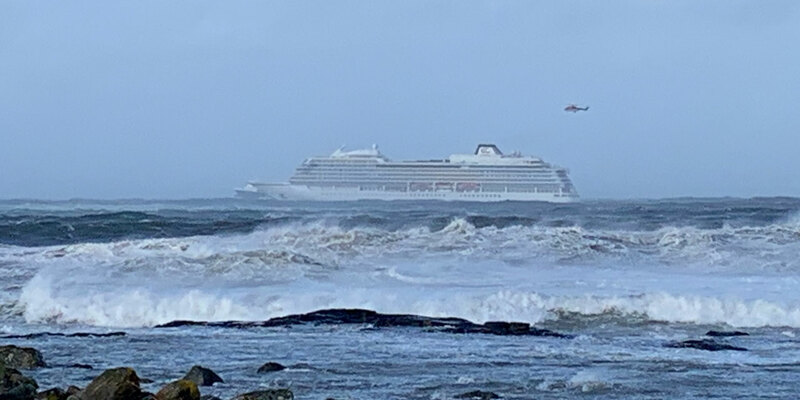 The images of the Norwegian media, filmed from the ground, showed the large white silhouette of the liner overflown by helicopters in rough seas. "It will take time to evacuate everyone," Franck said. Other boats were dispatched to the area. The incident occurred around 2 pm a few nautical miles off the region of Møre og Romsdal (western Norway), a region where several shipwrecks took place. "It is dangerous to encounter engine problems in these waters that hide many reefs," said Franck, adding that hollows were up to 8 meters Saturday. Other boats were dispatched to the area and a reception center was set up on the ground to accommodate the evacuees.